The first product of its kind to provide a 4-in-1 combination to effectively treat fluke, worms and lice in one easily applied pour-on solution. Allows farmers to apply a combination product containing both ivermectin and closantel to effectively treat immature and mature flukes, as well as all of the major gastro-intestinal roundworms of economic importance and both biting and sucking lice. Legal Category: POM-VPS. 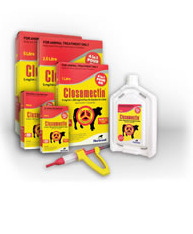 There are currently no questions for CLOSAMECTIN POUR-ON FOR CATTLE - be the first to ask one!